The internet seems divided about whether Daedelic Entertainment's sumptuously illustrated adventure games are any good or not, and soon there will be another for pointing-and-clicking fans to judge with the aid of their trusty mice. This one's only being published by Daedelic (and developed by Krams Design), but it looks every bit as lovely as the likes of Deponia, Memoria and The Whispered World. Anna's Quest begins in a fairytale forest, when a young girl named Anna sets out in search of a cure for her ailing Grandpa. After being kidnapped by a witch, Anna gains telekinetic powers (as you do), powers that enable her to escape and look for that cure. Or as the devs put it, it's a "fable-driven, black comedy ‘point and click’ adventure game that’s inspired by The Brothers Grimm & Hans Christian Andersen…with a sci-fi twist!" The E3 trailer up there explains the story a bit, while the following trailer shows some of the game in action. 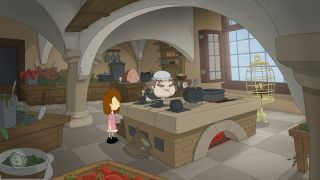 Anna's Quest is coming to Steam and GOG on July 2nd.